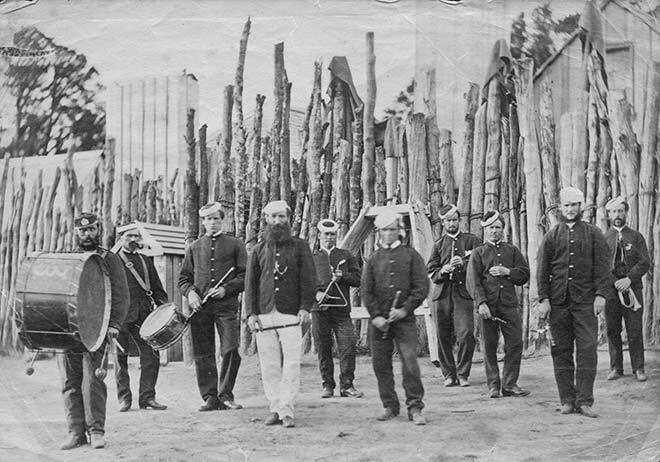 An armed constabulary band is shown at a defensive redoubt during the New Zealand wars in the late 1860s or early 1870s. Early military bands included brass, woodwind and percussion ensembles, as well as fife-and-drum bands such as the one in this photo. This band also includes a triangle and a bugle. The New Zealand wars brought British regimental bands to the colony, and local units were formed, which set up their own bands.